Well, as every American school child knows, this day in 1941, was “a date which will live in infamy.” Pearl Harbor was attacked by the Japanese. Two quick things. First, I’m sure FDR was thrilled, because he had been itching for a reason to get into the war because our UK allies were involved in it. Second, what we did to the Japanese in the following years decreases “infamy” to something more like “rudeness.” And don’t bother me about it. Just because modern warfare is accepted by much of the world does not mean that I have to accept it. Was the Pearl Harbor attack on civilians? No. Okay, on to more pleasant subjects. 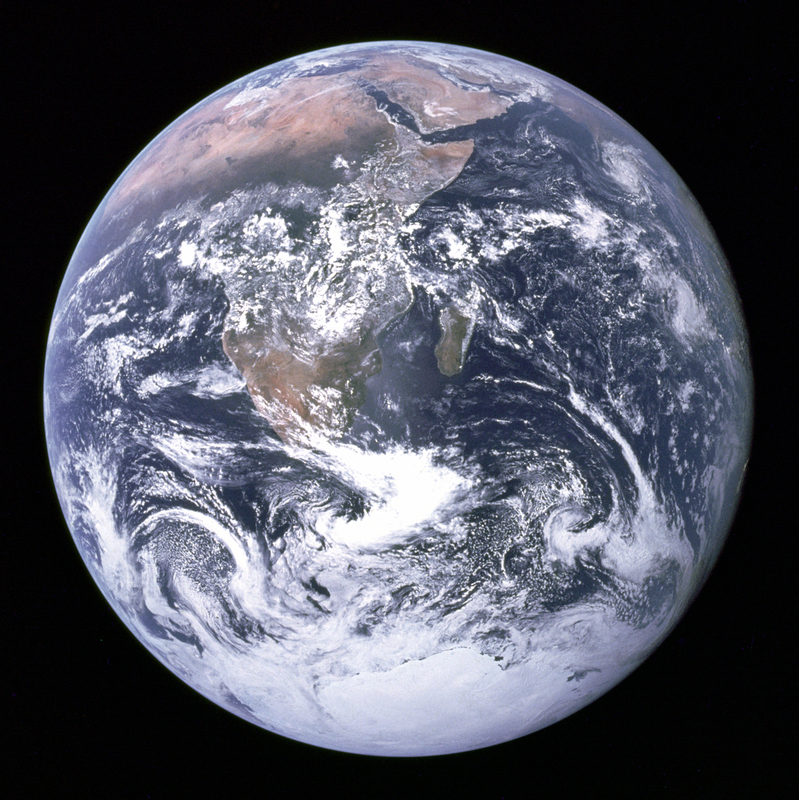 On this day in 1972, one of the most famous pictures in the history of humanity was taken: The Blue Marble. It was shot by the crew of the Apollo 17 — the same day that the mission was launched. It was the last time that we went to the Moon. We had gotten really good at going to the Moon, so Americans didn’t care. On the other hand, when we were fighting a pointless war in Vietnam, you have to wonder if they weren’t right. Regardless, the picture is spectacular. It makes Africa look kind of small. But more than that, it makes humanity look small and fragile. It makes me wonder about everything we fight over. There are currently 27 armed conflicts ongoing on in Africa. That’s half as many as there are countries in Africa. It’s just sad. It makes me wonder if this is why we die relatively young. Who could suffer the pain of watching humanity for hundreds of years? “The Blue Marble” by NASA/Apollo 17 crew; taken by either Harrison Schmitt or Ron Evans – Image: details. Licensed under Public Domain via Commons. To me, the infamy of starting a war with a sneak attack was always dwarfed by the sheer scale of atrocities in Manchuria and the rest of (what eventually became) the Greater East Asia Co-Prosperity Sphere; of course, none of that was enough to motivate us to enter the war, any more than the reports of death camps in Europe were. Right. What the Japanese did to other countries in the region seem to dwarf Pearl Harbor. It reminds me of Saddam Hussein and al-Assad who both did horrible things as we stood by. I remember after the chemical attack in Syria and how many people wanted blood. I thought, “Really?! After over a hundred thousand dead, now you want to do something?” I understand it. But I don’t think it is a tipping point. It’s not like Pearl Harbor was the last straw; it was the only straw. I read what Erick Erickson said on Twitter so maybe today is the day that Republicans gave jokesters yet another big fat target to mock. Then again, his parents were cruel enough to name him Erick. Also, Wikipedia’s editors are damn fast, his tweet is already part of his bio on there. Wow! I have a post going up in 3 minutes about the same thing — including the point about Wikipedia. But it ain’t editors. They can write. I thought the people behind the scenes were called editors. But regardless, it made me laugh. I don’t actually know. What I meant to say is that it was clearly added by some snarky liberal or clueless conservative, and not by any of Wikipedia’s paid staff, which I have the highest regard for. But I wasn’t meaning to correct you — just defend the honor of those good people! Oh yeah, it was added for the Lulz not because anyone particularly cares about the Ericksons’ dietary habits from thirty five years ago. I hope so. But I remember how people were changing the Paul Revere page because of what Sarah Palin said about him ringing bells. Of course, maybe I was wrong to think that was done by her fans. Maybe that done to mock her. I hadn’t thought about it at the time. You might have been-since the denizens of the internet are not big fans of the right wing in this country and enjoy mocking people. That very true. It reminds me of That Mitchell and Webb Look and their parody of The Apprentice. They comment about people watching stupid shows with a sense of irony, but they show up in the ratings just the same as the idiots.